I recently found this photo of an unknown family arriving in Ellis Island. This photo was taken at the same time Grandma Rossow would have been arriving, giving us a visual glimpse into what the world looked like at the time. Immigrants arriving would put on their 'Sunday Best' before the ship landed. 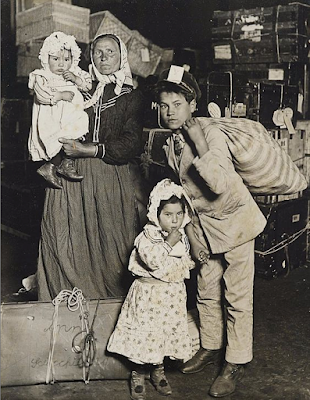 Most Italian immigrants had only two sets of clothing along with their church outfit. The bags likely held their clothing and any small items of value brought with them. Southern Italians averaged the lowest amount of money, $8.67, brought with them over all other immigrant races. Northern Italians averaged $23.53, almost triple their southern neighbors. They faced overwhelming prejudice and poverty in a strange country. This photo is a great reminder that despite the circumstances our ancestors endured, our family flourished and stayed strong thru prayer and hard work. Tell me your thoughts and if you can add to our family story! If you enjoy this blog, I'd be very grateful if you'd share with a friend....you never know who may be a potential cousin! I'm a genealogist spending my days in the corporate world, counting the days until retirement allows me to chase my ancestors. I am an avid gardener who collects old cookbooks, vintage kitchen items, Le Creuset cookware and loves to spend the weekend trying 'old' recipes. Watermark theme. Theme images by Lokibaho. Powered by Blogger.